Made to PASGT Helmet design spec. 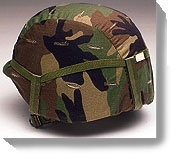 Fabric helmet cover-up features button holes for attaching native vegetation for field camouflage. Installs easily and stays on. 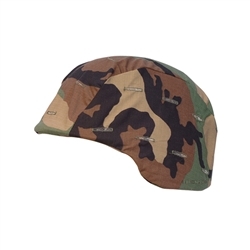 These fabric helmet covers protect the painted finish and help in camouflaging the headgear to match the clothing ensemble. The cover fits easily, but we recommend the Turtle Straps (Item RTS5670 Turtle Strap Kit) to keep it and the Elastic Cateye Band in place on the helmet. These fabric covers protect the painted finish and help in camouflaging the headgear to match the clothing ensemble. The cover fits easily, but we recommend the Turtle Straps (Item RTS5670) to keep it and the Elastic Cat Eye Band in place on the helmet.